The Spanish government walked back its cancellation on Thursday of the sale of 400 laser-guided bombs to Saudi Arabia, which has been devastating Yemen’s infrastructure and killing civilians in an effort to oust the Houthi government. Meanwhile, the US affirmed its support for the Saudi-led coalition on Wednesday within hours of a bombing that left more than a dozen dead. But it appears that for every step taken forward, two are taken back. Spain's former government signed a contract to sell the bombs to Riyadh in 2015, but after years of the crisis in Yemen worsening and specifically after the bus attack, Spain halted the sale, although the Spanish Defense Ministry wouldn't explain why. Local media reported that the administration of socialist Prime Minister Pedro Sanchez would pay back Saudi Arabia for the 9.2 million euros it had already fronted for the bombs. Spanish journalist Helena Villar says the deal was just a drop in the bucket. According to Amnesty International, Spain is one of the biggest arms suppliers to Saudi Arabia in the world. "The fact is that it is a minimal decision if we consider that between just 2015 and 2017, Spain, according to Amnesty International, exported 932 million euros in war supplies to Saudi Arabia," Villar told Sputnik News. 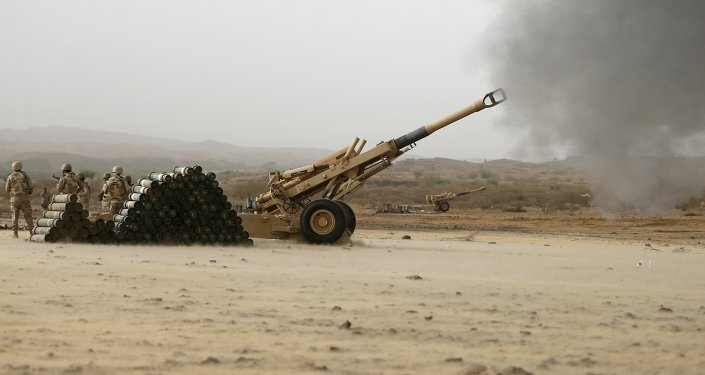 "A suspension of arms sales that does not reach 10 million euros is only about 1 percent of the material sold to the Saudis between 2015 and 2017," she added. Workers at a government shipyard in the south of Spain protested the halt of the bomb sale, arguing that Saudi Arabia may retaliate by cancelling its purchase of five warships at a price of 1.8 billion euros. Villar rejects that reasoning, telling Sputnik News that the halting of the bomb sales "did not affect" the sale of warships, which, she noted, "were also going to be used in the Yemen war." "In addition to the controversy of selling arms to a country that violates human rights and is the author of massacres in Yemen," Villar said, the mayor of the town the shipyard sits in, Cádiz, who belongs to the leftist party Podemos, has also been heavily criticized for supporting the contracts in the name of job creation. "It should be noticed that one of the main problems in Spain is unemployment, but a huge leftist sector criticized him for putting the employment of workers in his city before human rights," she told Sputnik News. Spain reversed its decision to halt the bomb sale to the Saudis on Thursday. Spanish Foreign Minister Josep Borrell announced the cancelation, later telling a local radio station, "After an intense week's work by various ministries — including the Foreign Ministry — the decision is that these bombs will be delivered to honor a contract from 2015, which was made by the previous government and in which no irregularity has been detected that would bar it from happening." The reversal came one day after a coalition bombing of a bus station in Hodeidah, a port city that serves as a lifeline for Yemen, as it is used to bring in essential supplies. Yemeni journalist Ahmad Algohbary reported the attack that left between 15 and 20 killed and more wounded, including children. Borrell downplayed the potential for Spain's precision bombs to cause collateral damage or loss of civilian life and infrastructure, arguing, "You don't get the bombings that you get with less sophisticated weapons that are dropped rather randomly and which cause the kind of tragedy that we've all condemned." "It must not be forgotten that the European Parliament requested the cessation of arms sales to Saudi Arabia in November 2017," Villar said. Nonetheless, "Saudi Arabia has always been a close ally of Spain. In fact, last April, King Felipe VI was received by Saudi ruler Mohammed bin Salman in his palace with all of the honors." Within hours of the bus station bombing on Wednesday, UAE Ambassador to the United States Yousef al-Otaiba published an op-ed in the Washington Post declaring that "the UAE is absolutely clear about our vision of the region and the partners who share it." Spain, however, is not the only country reassessing its support for the coalition in which Saudi Arabia and the UAE are the most overtly hostile actors. The bomb used by Saudi Arabia on August 9 was supplied by the US State Department. Another bombing on August 23 of a transport vehicle carrying people fleeing violence in Hodeidah killed at least 22 children and four women, while another four children were killed the same day. The US has also been supplying the Saudis with targeting information and intelligence, helping to enforce the Saudi naval blockade of the country (and exacerbating the already widespread food insecurity and famine), and has even sent US soldiers to help the Saudis find and destroy Houthi weapons. On Wednesday, United States Secretary of State Mike Pompeo certified to Congress that Saudi Arabia and its coalition partner the United Arab Emirates are taking the necessary steps to reduce the risk of civilian casualties and destruction of civil infrastructure. That came after a provision in the National Defense Authorization Act (NDAA), the US' defense spending bill, which required that the government assess the actions of its partners or curtail its support for them. "I endorse and fully support Secretary Pompeo's certification to the Congress that the governments of Saudi Arabia and United Arab Emirates are making every effort to reduce the risk of civilian casualties and collateral damage to civilian infrastructure resulting from their military operations to end the civil war in Yemen," US Defense Secretary James Mattis said in a statement.